Many people feel apprehensive about undergoing orthodontic treatment due to the aesthetic impact metal wires and brackets have on their appearance. Especially for adults who have upcoming social events or gatherings, the thought of showcasing metal braces is unappealing. 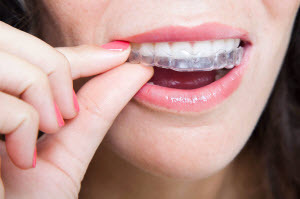 Our dentist, Dr. Zoya Mitelberg, at the Dental Arts of Totowa provides Invisalign® clear aligners, a solution to discreetly obtain straight teeth without dramatically affecting one’s appearance. Additionally, Invisalign trays are removable, making them a convenient method for many patients as they do not impose the same restrictions that metal-based orthodontics do. Since patients can take out and reinsert the appliances, they can control their treatment, which provides them with a sense of comfort. Many people achieve their ideal smile without feeling hindered by their braces. What does the Invisalign orthodontic system resolve? Overcrowding- The smile does not have enough room for the teeth to align properly. Overcrowding can also lead to tooth decay and raises a person’s risk of developing periodontal disease. Gaps between teeth- This can be a result of prolonged missing teeth or due to the jaw growing abnormally. Overbite and underbite - These occur when the upper arch projects further than the lower set of teeth, and vice-versa. Both increase a person’s chances of developing jaw pain and TMJ disorder. Invisalign clear trays go unnoticed by others and gently shift teeth into improved positions. The appliances are removable but must be worn by 22 hours a day. Patients do not have to add any more steps to their dental care routine as they can simply take them out, brush and floss, then put them back in after rinsing the trays with lukewarm water. Before getting your clear braces, you must first have your smile examined by Dr. Mitelberg to determine if you will receive all the benefits the orthodontic system has to offer. Once you have been approved to undergo Invisalign treatment, an impression is taken of your dental anatomy and sent to the Invisalign lab. Your first set of trays are sent back to our practice as well as predictions of the alignment process during different periods of treatment. Contact the Dental Arts of Totowa Today! Our Totowa dental team enjoys helping our patients achieve their desired smiles while exceeding their expectations with our high-quality care. Our attention to detail and aesthetically-minded treatments rejuvenate the appearance of patients’ smiles while improving their oral health.